A year ago, I came very close to falling victim to a variant of the so-called “Grandparents Scam.” The scam works like this. Someone posing as your granddaughter or grandson, affecting distress, phones to tell you that he or she is in deep trouble in a distant land. She has been jailed for a given offence, and is too embarrassed to ask her parents for help. So she asks for your money. And you send it. To pull it off, the scammer must make the victim feel that she is indeed a relative that you have lost touch with. That’s the first hurdle. But the second one is to convince the victim of the urgency of sending the money. You must act now before it is too late. Hurry. Once the victim’s emotional button has been pressed — and there is little time to stop and think — sending a money order to her fake lawyer post-haste is a likely response. In my case, two imposters —who should be given an Oscar for their performance — succeeded in making me believe that my nephew — whom I had not seen for years — was about to be sent to jail if money was not sent to his lawyer immediately. It is a long story, but I almost bought the pitch. Imagine, a ‘smart’ guy like me. Following the phone call, I called the police, and was referred to the West Vancouver Police Department, and a certain Constable who specializes in that scam. Why West Vancouver? Because it’s target rich. It has a very high density of rich grandparents and folks in my age category. Folks who want to leave a legacy, or do something for those in our family who need our help. During the interview, the Constable revealed a very interesting fact. You don’t have to be a sucker or simpleton to fall for this scam. Some very intelligent and well-educated people, including retired doctors, engineers, architects and teachers have been taken in. Why? Of course, some people are more susceptible to this kind of emotional manipulation than others. Especially those who do not use the left side of their brains to its full potential. Creative, right-brain people typically cannot think in quantitative terms. They are governed by emotions, and ooze with empathy, which has become the buzzword of pathological altruism. They are typically innumerate — and typically leftist in their politics. When they tell us that we must fund the Arts, or invest more in education or the health care system or daycare or outreach programs for under-represented minorities, they will not say how much. When they tell us that we must run a deficit to kick-start the economy, they will not say how much or when it will be paid down. When they tell us that we must accept more immigrants or refugees, they won’t tell us how many. They will only say “more.” And if they do give a figure, it is only provisional, a stepping stone to future solicitations. Their demands are always open-ended. The goal posts are always moving. They are not numbers people because their emotions are in the driver’s seat, and they make a point of showcasing their “compassion,” especially those of them who are running for office. Slogans like “People before profits” and “The economy exists to serve the people, not the other way around” fit their mindset. When you want to appeal to emotions to win the day, it always useful to present a false antithesis. That is why the Arts Community in Canada is almost uniformly in support of the far left New Democratic Party. And naturally, they drink from the trough of the CBC Pravda, which, like public radio and television in the U.S., presents itself as the voice of elite (i.e., left) culture and artistic expression. If you see an NDP lawn sign, most likely you will see a “We Vote CBC” alongside of it. It is therefore imperative that in order to mobilize the vast numbers of people who “think” in this fashion, the state media — and the social media — frame the refugee debate in purely emotional terms. Pictures of desperate people, of tragedy being played out every day and every hour, must be front and centre of every news item on the subject. The tragedy must be given a human face. However, those in the host countries who must move over for these migrants, or see their social safety net collapse from the burden, or face future job displacement from cheap labour, are left unseen by the cameras. There is no human face attached to their plight. The only images of them that we are permitted to see are those of angry demonstrators — spiced up with a few neo-Nazis for good measure — shouting outside of migrant reception areas. Nothing like tarring legitimate outrage with the Nazi brush to discredit their grievances. The discussion must not be allowed to stray into the cold territory of numbers, resources, or likely long-term effects. Viewers must not be confronted with the reality that Europe simply does not have the capacity to accommodate the numbers of people who seek sanctuary and residence within its borders. Or that so-called “rich” countries like Canada and the United States, propped up by fiat currency and a bubble of purchasing power, cannot accept the hundreds of millions, and possibly billions of migrants who are anxious to flee poverty, famine or war. In short, viewers must not be allowed to understand the concept of limits. 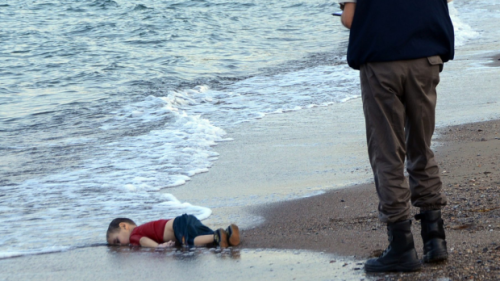 If Western civilization is to be buried in an avalanche of migrants, its epitaph will be, “They died of misplaced empathy.” Empathy stoked up by photos and images promoted by our hostile elites in the media, eagerly grasped by ambitious politicians, and channeled towards the outsider at the expense of those within our ranks who are asked to sacrifice their space, their resources and their cultural heritage to serve the cause of “humanity.” Of course, those who would oppose this agenda are characterized as callous or selfish — worse. But the issue is not one of compassion or lack thereof, but to whom compassion should be directed. Who should receive priority. Them — or us? Theirs — or ours? “Tim Murray” is a frequent contributor to the website of The Council of European Canadians.